Busting the myths about the criminal bar. Image: 2014 walk-outs by criminal barristers over legal aid cuts - action has now escalated. Credit: Stefan Rousseau/PA Images, all rights reserved. Many barristers take on exclusively (or almost exclusively) legal aid work—I was one of them. In criminal cases, it’s common for barristers early on in their career to represent someone at court for under £100—and sometimes as little as £50. 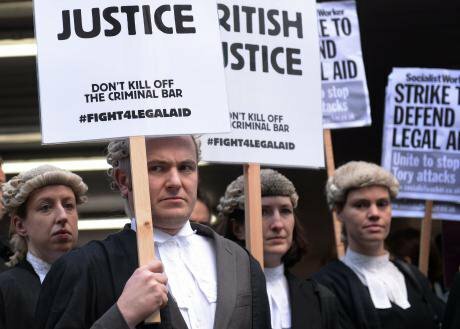 Since then, repeated cuts to legal aid have meant barristers’ fees have plummeted more than 40 per cent in real terms. I can’t count the number of elderly and mentally ill defendants I’ve seen arguing their case alone in front of a judge, fighting for their liberty. It’s shameful. It’s also crucial for justice that the criminal bar attracts the best and the brightest from a wide range of backgrounds. It has become nigh on impossible for students who aren’t from privileged, middle-class families, backed up by the bank of mum and dad, to thrive—or even survive—as criminal barristers. Some have spoken out about being even unable to afford their train ticket to court or relying on their Boots Advantage Card to be able to afford lunch. I applaud the criminal barristers now refusing to work in protest. And I’d be joining them, if I hadn’t already thrown in the towel and left the bar two years ago.